That’s 23 goals (out of 64 scored) from set-pieces, and I’m not even including the goals that started from well-placed throw-ins as with my previous set-piece episodes, I’m going to delve (this episode will focus on the corners scored) into the goals Midtjylland scored from free-kicks and corners to see how exactly they managed to get this edge, and with it their first Superliga title. 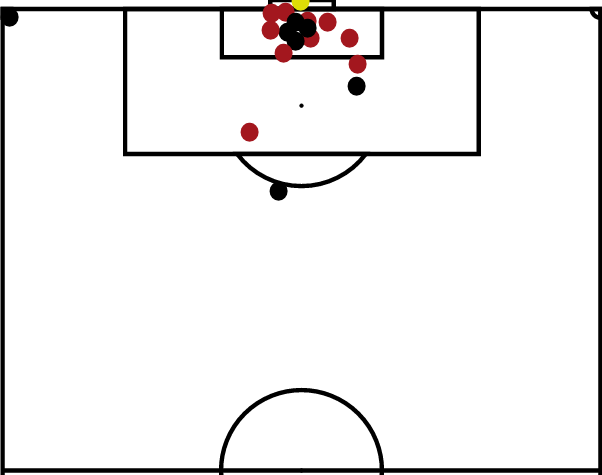 With 8 goals from 156 corners, Midtjylland comes out with a 5.12% conversion rate, only marginally higher than the expected conversion rate of around 3%, however, this emphasises my series so far and why I think set-pieces are underrated in football. Had Midtjylland hit the average of 3% they’d have ended up with 2 goals less which considering they won the title by 4 points – could be the difference between winning the title or not. The duo of Morten Rasmussen (#9) and Andre Romer (#28) start in the 6 yard box but run outwards, dragging their markers with them, this creates space for the cluster of Francis Dickoh (#20), Patrick Banggaard (#26) and Paul Onuachu (#33) to run and attack. Onuachu is dragged down which affects his header, but luckily Banggaard is there to tuck away the rebound. A simple tactic, but one we’ve seen time and time again in the other set-piece articles in the series. 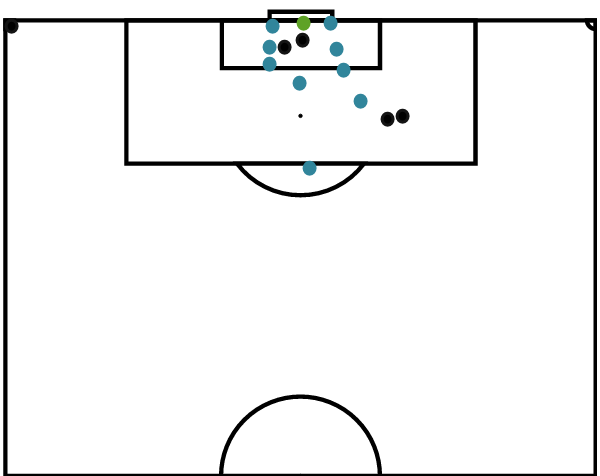 Similar patterns of movement to the first corner, this time both Midtjylland and Esbjerg pack the 6-yard box (with an incredible 10 players crammed into it!). As the corner is delivered the three Midtjylland players in the 6-yard box make runs (with slightly less movement than the above) for Jim Larsen (#6) to tower up and head from his run towards the back-post. Sadly couldn’t work out shirt numbers from the clips at my disposal but the concept is easy enough – as you can see, both teams have again packed the 6 yard box with the ball floated in towards the edge of the 6 yard area again, there’s not much movement (although the players in the 6 yard box all do make their own runs to create space) before the ball is bundled into the back of the net. 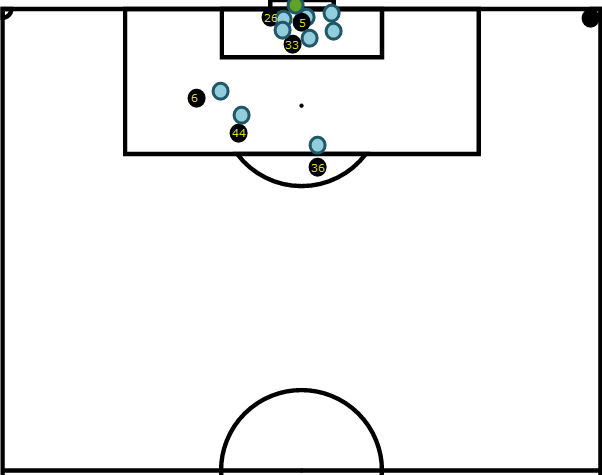 A pattern seems to be forming here…once again plenty of players crammed into the 6-yard box. The corner looks to be hit shorter than I would’ve expected based on the delivery of the rest of the corners, but that shows the advantage of having players making runs into different directions – as proven here with a near post flick on providing an assist for one of the onrushing players to score. 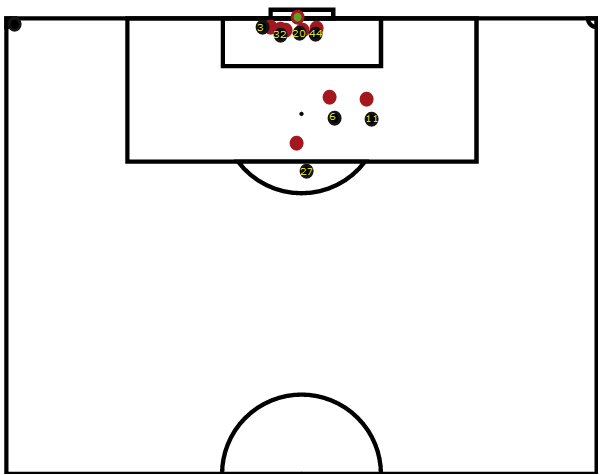 An interesting approach here, Midtjylland only have 4 players in the box (compared to OBs 8 + goalkeeper). 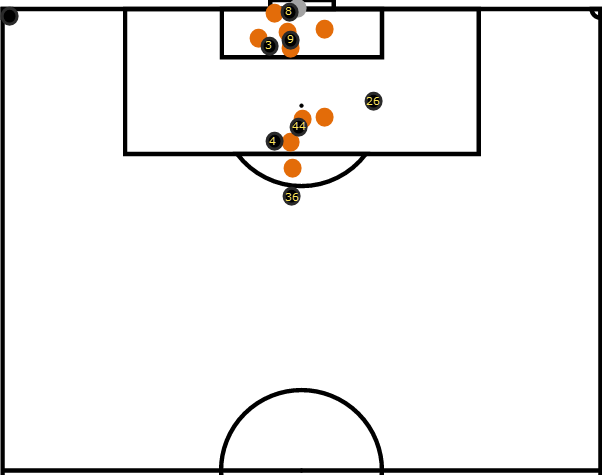 Despite that Midtjylland manage to head home from 5 yards out due to some poor defensive work – in my opinion, not man-marking players that close to your goal is asking for trouble, especially if you’re outnumbering them in the numbers that OB are here. I’m not entirely sure what the Midtjylland strategy was for this corner unless they’d noticed a weakness in OBs defensive set-up which was then exploited. Back to the pattern, 2 players in the 6-yard box pressuring the keeper with man-markers. As the kick-taker begins his run-up Tim Sparv (#3) makes a run to the near post, taking his marker with him. He beats his man to the ball winning a flick on that is then hit home by one of the attacking trio that starts by lurking at the edge of the box and make runs in towards goal. An interestingly set-up corner, and again beginning to notice another pattern. The ball is whipped in, the players grouped by the penalty spot all make inward runs with Erik Sviatchenko (#4) winning the header, knocking it down for someone to convert from close-range. So what can we learn from the above corners? Midtjylland definitely have a plan. They always have a few players in the 6-yard box that make runs into good positions, this has the effect of firstly creating space for the group of oncoming runners. 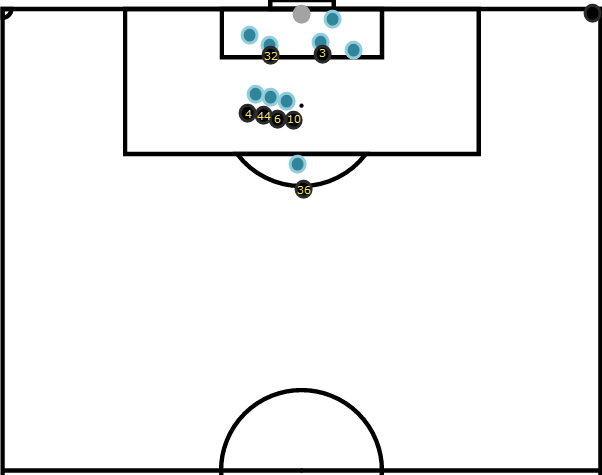 Secondly, this gives the option of flick-ons (whether they be deliberate or from a poor delivery) into the space previously occupied – again where there’ll now be extra bodies to try to bundle the ball home (and a shot from that range will normally always equal a goal). The runners from deep are another key factor, this is a common trend across all the teams we’ve analysed so far, players making runs from the edge of the box inwards, this is a hugely effective tactic as it’s so much easier to attack a ball being crossed in from that area running onto it than it is to defend the same ball. So it’s no surprise that Midtjylland scored plenty of goals from corners with belief and a clear plan of each player’s role from corners. Join me next week for part 2 where I examine Midtjylland’s free kick routines.